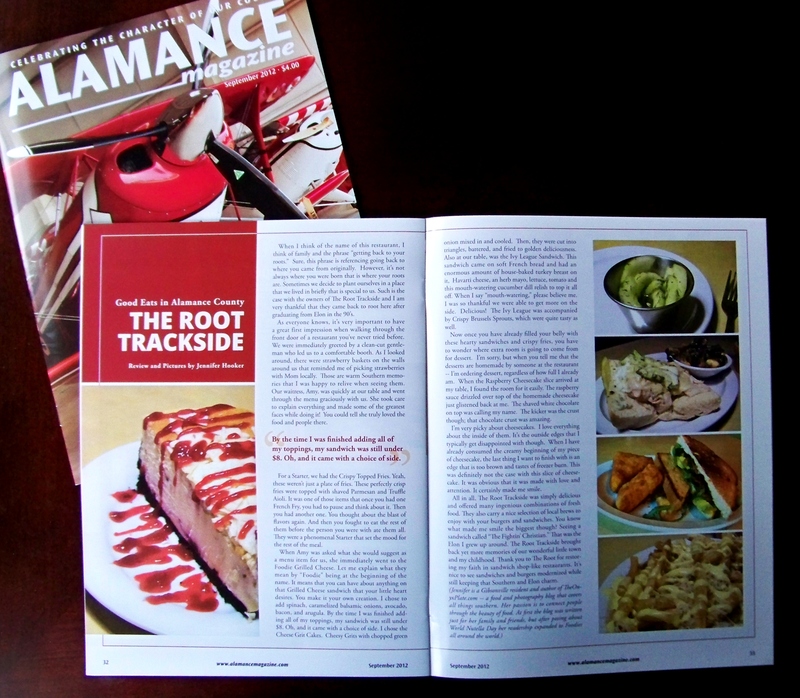 Am I allowed to call myself a Published Food Critic now? I’m published! I’m published! I’m published! If you’ve been following The Onyx Plate on Facebook and Twitter, you might already know this little bit of information…and you very well might be tired of hearing about it. My apologies if so. Otherwise, I’m super excited and extremely proud of myself. Did I just say that? I did…hmmmm. I’m PROUD of myself and my accomplishments thus far on my path to a food career. This may be old territory for some of you reading this, but this is a whole new horizon I’m looking at! Yay! Below is what was published in the magazine, along with photographs of the layout. I’M SO EXCITED! 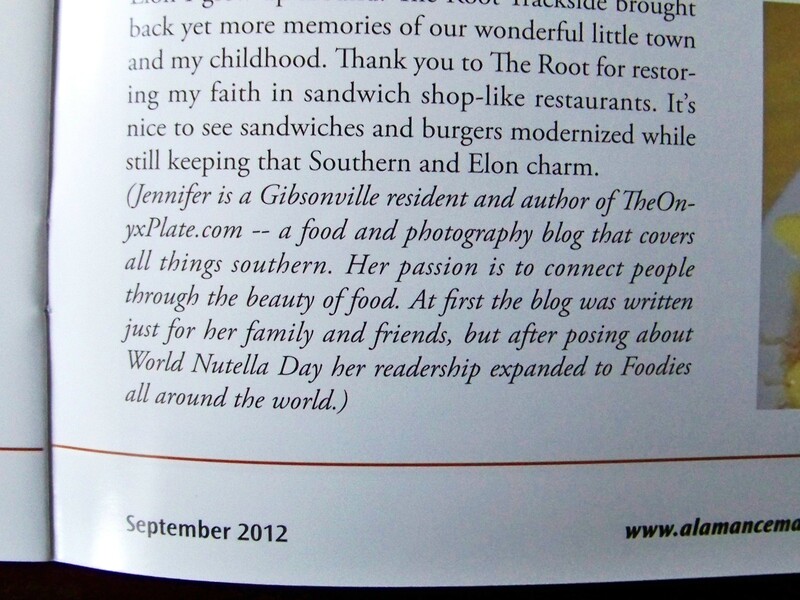 The main question though…Am I allowed to call myself a Published Food Critic now? When I think of the name of this restaurant, I can’t help but think of family and the phrase “getting back to your roots”. Sure, this phrase definitely is referencing the act of going back to where you came from or going back to the beginning in essence. However, it’s not always about where you came from originally that could be considered your roots in life. Truthfully, life takes us to a thousand different places and through five thousand different situations. We meet people along the way that shape and mold our lives, and we also live in places that add to our character and define who we are as a person. Sometimes along that way though, we decide to plant ourselves. Not necessarily where we first took root with our family, but where we planted ourselves along our road in life. Something drew us back to that special place, and something made us want to root in fresh soil. Such is the case with the owners of The Root Trackside, and I am very thankful that they came back after graduating from Elon in the 90s. As everyone knows, it’s very important to have a great first impression when walking through the front door of a restaurant you’ve never tried before. We were immediately greeted by a clean-cut gentleman who led us to a comfortable booth. As I looked around, there were strawberry baskets on the walls around us that reminded me of picking strawberries with my Mom locally. Those are warm Southern memories that I was happy to remember when seeing them. The waitress, Amy, was quickly at our table and went through the menu graciously with us. She took care to explain everything and made some of the greatest faces while doing it! You could tell she truly loved the food and people there, and I can appreciate that. For a Starter, we had the Crispy Topped Fries. Yeah, these weren’t just a plate of fries. These perfectly crisp fries were topped with shaved Parmesan and Truffle Aioli. It was one of those items that once you had one French Fry, you had to pause and think about it, then you had another one, thought about the blast of flavors again, and then fought to eat the rest of them before the person you were with ate them all. They were a phenomenal Starter that set the mood for the rest of the meal. When Amy was asked what she would suggest as a menu item for us, she immediately went to the Foodie Grilled Cheese. Let me explain what they mean by “Foodie” being at the beginning of the name. It means that you can have about anything on that Grilled Cheese sandwich that your little heart desires and make it your own creation. I chose to add spinach, caramelized balsamic onions, avocado, bacon, and arugula. By the time I was finished adding all of my toppings, my sandwich was still under $8. Oh, and it came with a choice of side. I chose the Cheese Grit Cakes. Cheesy Grits with chopped green onion mixed in and cooled. Then, they were cut into triangles, battered, and fried to golden deliciousness. Also at our table, was the Ivy League Sandwich. This sandwich came on soft French bread and had an enormous amount of house-baked turkey breast on it, Havarti cheese, an herb mayo, lettuce, tomato and this mouth-watering cucumber dill relish to top it all off. When I say “mouth-watering”, please believe me. I was so thankful we were able to get more on the side. Delicious! The Ivy League was accompanied by Crispy Brussels Sprouts, which were quite tasty as well. Now once you have already filled your belly with these hearty sandwiches and crispy fries, you have to wonder where extra room is going to come from for dessert. I’m sorry, but when you tell me that the desserts are homemade by someone at the restaurant…I’m ordering dessert, regardless of how full I already am. When the Raspberry Cheesecake slice arrived at my table, I found the room for it easily. 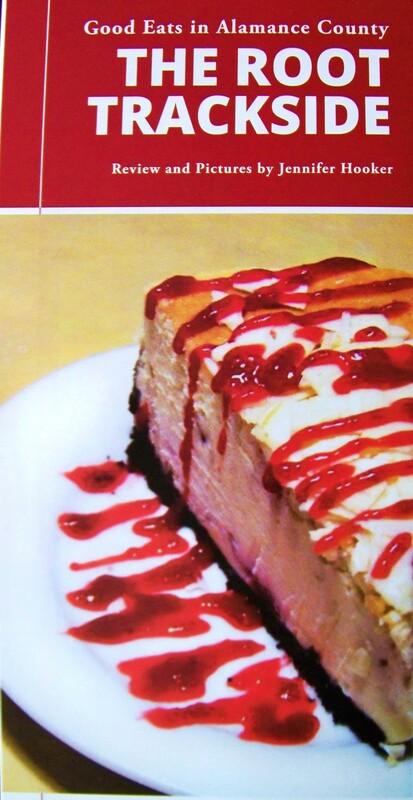 The raspberry sauce drizzled over top of the homemade cheesecake just glistened back at me. The shaved white chocolate on top was calling my name. The kicker was the crust though. That chocolate crust was amazing. I’m very picky about cheesecakes. I love everything about the inside of them. It’s the outside edges that I typically get disappointed with though. When I have already consumed the creamy beginning of my piece of cheesecake, the last thing I want to finish with is an edge that is too brown and tastes of freezer burn. This was definitely not the case with this slice of cheesecake. It was obvious that it was made with love and attention. It certainly made me smile. 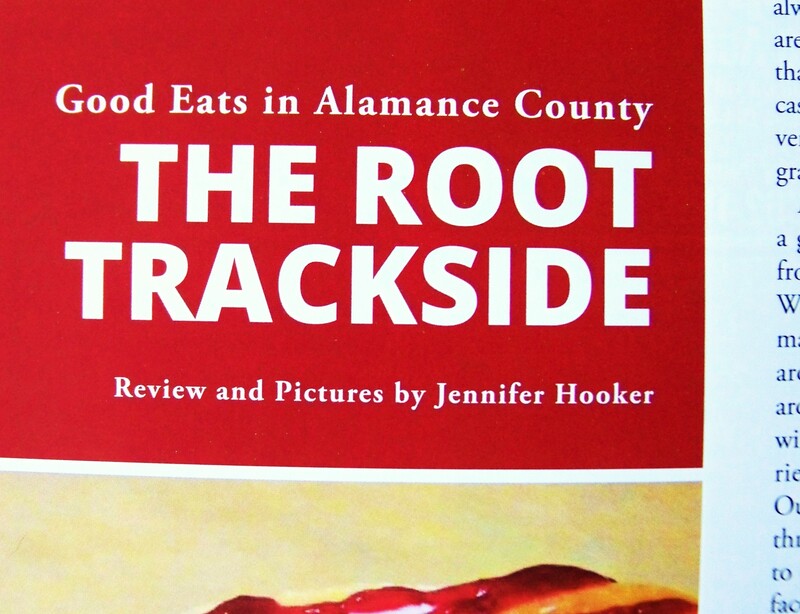 All in all, The Root Trackside was simply delicious and offered many ingenious combinations of fresh food. They also carry a nice selection of local brews to enjoy with your burgers and sandwiches. You know what made me smile the biggest though? Seeing a sandwich called “The Fightin’ Christian”. That was the Elon I grew up around, and The Root Trackside brought back yet more memories of our wonderful little town and my childhood. Thank you to The Root for restoring my faith in sandwich shop-like restaurants. It’s nice to see sandwiches and burgers modernized while still keeping that Southern and Elon charm. Previous Post Rambling on my way to my 30s and a Cooking Class on 9/5/12!!! Yay! Congratulations and what a review! I’m salivating! Gosh! talk about mouth watering….I felt like I was right there with you. Yes you ARE a Published Food Critic! You go girl. Sending lots of love from Ohio. Thank you so much, Bobbie!!! :) I can feel the love, and it’s greatly appreciated! Way to go Jen! I might have to eat there sometime! Congratulations! I am so proud of you.